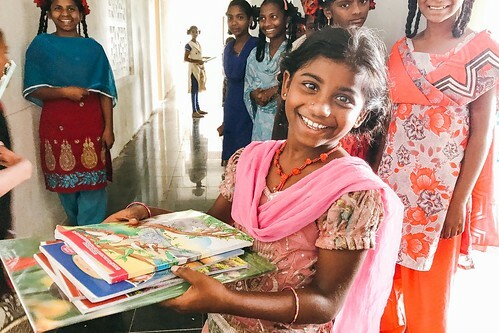 Photo: An orphan girl living at our girls home is overjoyed that she has the chance to attend school, knowing that 1 out of 5 of her peers will not have such a chance. June 27, 2017. Today we bring you an exciting update about our India primary school which is celebrating its 10th year of operation with a brand new school semester that began on June 22nd. When we first opened the school for the 2007-2008 school year we had approximately 22 children from the orphan home enrolled, 3 classrooms, and it cost us around $388 per month to run the school. Thanks to your prayers and immense generosity we have grown substantially during the past decade. We currently have 101 children (ages 6-16) enrolled in school this semester where they are studying their native Telugu and Hindi languages, English, math, science, and social studies taught by our 10 dedicated teachers. We are now utilizing 10 classrooms as well as a computer room, thus it costs us $2,328 to run the school each month. We are thankful for your faithful support which keeps our primary school up and running each semester, giving our children the blessing of a good education. They are always excited to get back into the classroom where their education will equip their minds with valuable knowledge to ensure a fruitful livelihood in their future. To commemorate the success of our primary school over the past 10 years, we’d like to share the story of one child who graduated from our school, Rajesh, who lived in our boys’ orphan home. He lost his father during childhood, thus his mother was not able to feed Rajesh nor his brother or sister. Due to their dire circumstances, his mother sent Rajesh to a landlord to be his bond slave in order to get some money in the exchange — sadly, this is still a common practice in India. But soon after her decision, she learned about the boys home from a barber in her village. She brought her children to live with us and enrolled them in our school. Rajesh’s sister stopped her education in 7th grade, but he continued his education until the 10th grade and graduated with straight A’s. Then Rajesh went on to study engineering. Sadly, during this phase of his studies, his mother, brother, and sister passed away, and our boys home was a great comfort as he mourned, giving him shelter, financial support for his education, and a loving family environment. Rajesh completed his education with degree in engineering, he got married, and now he has a good job in a private company earning a high income salary by Indian standards. In other good news, we are hoping to start up the high school for the 2018-2019 school year. All of the high school classroom facilities have recently been completed, and we have already met all the requirements for our high school to gain accreditation: the 31-seat school bus which we purchased in August 2015, enabling us to safely transport our children around the city as well as take them on fun excursions and field trips; and the construction of a new high school building, which was completed in September 2016, offering adequate classrooms, a lab room, a computer room, and an administrative office. Then in March of this year, we purchased 1.3 acres of land adjacent to our main campus, which will be used for an athletic field and future expansion. The acquisition of an athletic field was the final requirement for our new high school to gain accreditation. The only tasks which remain to get our high school up to a full operational status are to build a perimeter wall surrounding the new field, raise the ground level to prevent any flooding during the rainy seasons, and to install new playground equipment for the children. Then we can begin to make plans to sustain a budget to operate the high school in the 2018-2019 school year — we need to raise an additional $2,560 per month through our Sustainer's Circle, our monthly donor team. Once the first two years of the high school are behind us, we expect that tuition paid by families from the local community will help sustain the budget of the high school, and eventually will sustain it 100%. 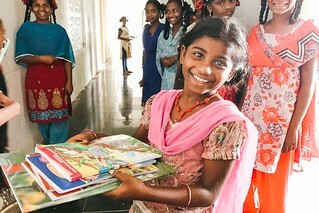 While our India campus has always been home to an accredited elementary school, we decided to also start a high school on our campus because our children have to travel very far to attend higher classes, and are bullied because they come from families below the standard poverty line — they are Dalits (outside of the caste system, “untouchables”). It’s our desire to provide them with an accredited high school free of discrimination, a safe place for us to cultivate their talent and intelligence, knowing that love and education are the keys to overcoming this dangerous stereotype. We are deeply thankful for your prayers and support, and we look forward to reporting back with our progress in improving the lives of our children through the blessing of a high school education. Most of all, we are thrilled that our high school will now be able to receive accreditation when it opens next year, a longtime goal that we have dreamed of achieving.